Today I’d like to share the first in a four-part series about some of the interesting things I learned while researching my new novel, Taylor Davis and the Flame of Findul. First topic—medieval weapons! Each of my four main characters has been matched with a primary weapon that fits their strength and personality. 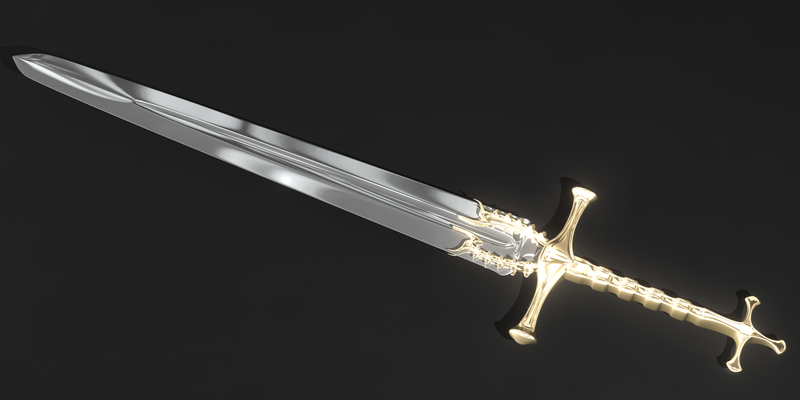 The Flame of Findul, the crowning weapon of the story, has been given to Taylor. It was forged of the finest Raybold steel–the only metal that can destroy supernatural beings and remain completely invisible to human detection devices. It was first used by Findul the firesmith to guard the Tree of Life, but in the course of history, the flame went out. It is Taylor’s job to find the forge of Findul and rekindle the sword to stave off those who would destroy the tree. There’s an awful lot of overlap when you start distinguishing between different kinds of swords, but a typical broadsword had two cutting edges and was held with both hands. It could weigh four or five pounds and was about four feet in length. 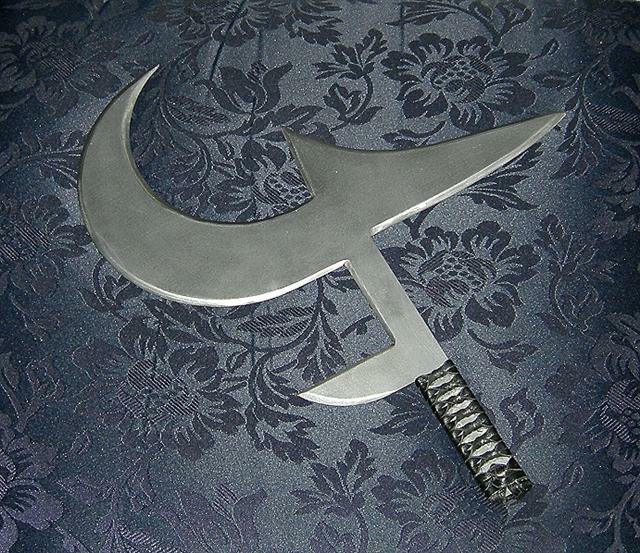 It was actually used for slashing, not thrusting. The Scots had their own distinct version of the broadsword, a two-handed beast that could weigh over eight pounds. I didn’t figure thirteen-year-old Taylor could manage one of those, so I gave him a more traditional design. The problem is, Taylor’s skill in battle leaves room for improvement! 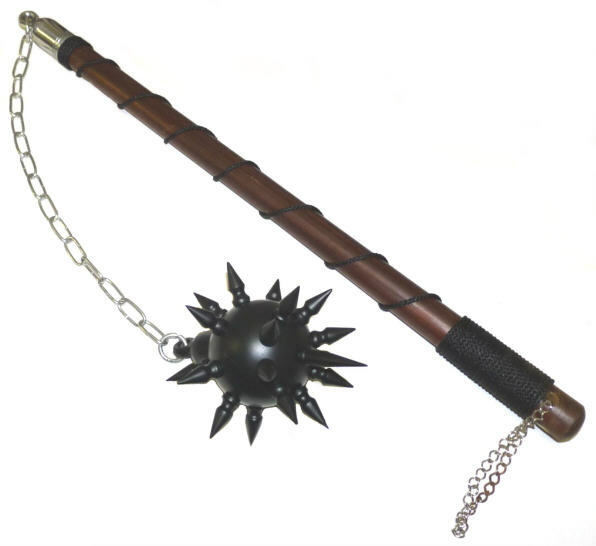 What I think of as a mace is technically called a flail and traces its origin to an agricultural tool that was used to thresh grain. In a pinch, it was called upon as a weapon. Originally it was just a wooden rod attached to a handle by two or three links of chain, but the design began to improve. Wood was changed to iron, and spikes were added the business end. The spiked ball used by Ranofur, a dauntless angel with a physique like Superman, is a variant design called a morning star. These spiked balls were also sometimes mounted on the end of a club. 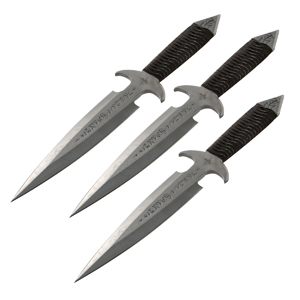 Throwing knives came in all sorts of designs, from sleek and streamlined to wickedly curved to oriental star designs. I made the somewhat cowardly angel, Mike, proficient with knives because he’s not fond of closing with the enemy. Though this little beauty is never called by its name, nor is it specifically assigned to a character, it is described in the scene when Ranofur first spreads out his arsenal. This was an African throwing knife, though it could be used in hand-to-hand combat. It wasn’t introduced to Europeans until the Colonial period, but it was too cool not to include with more typical swords and daggers. Elena received a crossbow so she wouldn’t have to engage in any hand-to-hand combat. She wields it well. In fact, she proves so adept in battle, Taylor grows a little jealous. 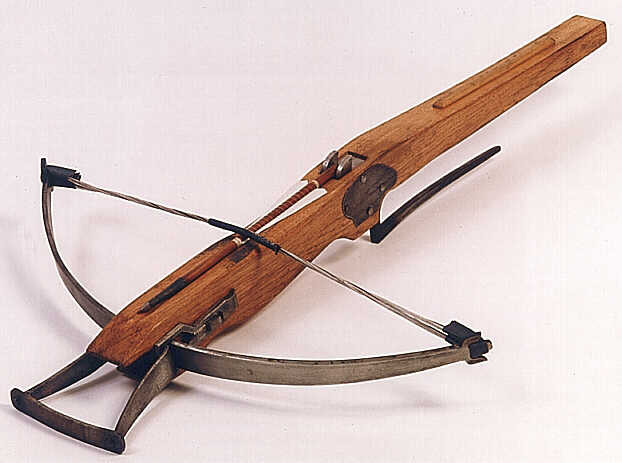 A crossbow is an improvement on the traditional longbow in that it packs more power and it’s deadly silent. Elena was also given a leather pouch treated with a multiplying agent so when she fires her one bolt, another will automatically appear. Cuts down on the equipment she needs to carry. 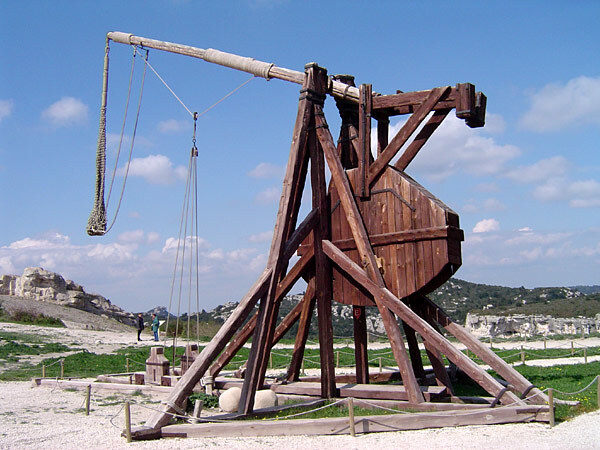 The trebuchet, or catapult, is just a wickedly awesome machine that warrants mentioning even though I haven’t found a use for it in the series—yet. With the use of counterweights, for the first time, it gave armies long range and heavy ammo. Yes, the flamethrower originated in medieval times, though only the Byzantines had the technology. Pressurized siphons sprayed a flaming liquid called Greek Fire on the enemy. It was generally used for naval battles. There was, however, a hand-held counterpart. They guarded the secret so closely it has since been lost. Again, I didn’t use this one, but how could I not throw it in here? Now before you assume I’m some kind of wacko sadist, please keep in mind our heroes hunt only monsters who turn into green goo upon their demise. Taylor Davis remains, for the most part, fun and bloodless. At least it’s been a riot to write. I hope kids enjoy the adventure as fully as I have! Next week: the Tyburn Hanging Tree. You’re funny, Erik. 🙂 Pretty cool stuff, huh? I love the history behind all this. I don’t like to think of any of it being USED, except perhaps against green goo monsters. Interesting information. Definitely good to know all this stuff. I’m looking down the barrel of some serious research for my WIP, and it’s kind of daunting. Yes, I’m trying the “complaining” route, lol. It worked great for the first book in my trilogy. It did take a couple weeks for me, too. I’ve got a book on the back burner that’s going to take some serious research. Daunting is right. This one was easy. Research took days, not the months that went into my historical fiction. Great to hear from you, Paul. All’s quiet on your blogging front lately. I’ll scoot over there. Maybe I just haven’t been getting them….Nope, all’s quiet. It’s nice to take a break, isn’t it? Actually I’m giggling at opening your post and seeing all of those weapons. I know it’s research for a medieval period, but it seems so out of character for you — weapons and violence. You’ve really peaked my interest and will have to read your novel — I hope there is hard copy to purchase. You can’t fight monsters with your bare hands, Pat! 🙂 Yes, a little out of character. But fun. “Taylor” will be coming out in paperback, Kindle, Nook, Smashwords and even Kobo format by the first of May, probably sooner. Great! I had to poke fun!